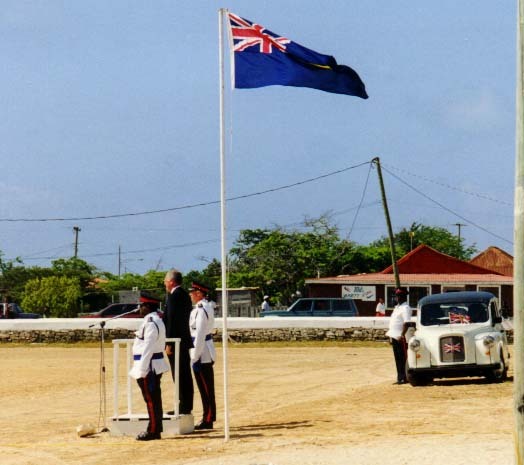 This photo shows the Policemen's Band performing at the parade grounds in Cockburn Town on National Heroes Day, May, 1998. National Heroes Day commemorates soldiers of Turks and Caicos. The national holiday is on the last Monday in May, just like Memorial Day in the United States. Here Governor Martin Bourke (the man on the platform) reviews the band's performance. The Turks and Caicos islands are a British colony. Governor Martin Bourke was appointed by Queen Elizabeth II. The Turks and Caicos also have a local government elected by its citizens. Chief Minister Derek Taylor leads the Turks and Caicos local government. Notice the national flag of the Turks and Caicos islands waving in the gentle breeze of the easterly trade winds. Copyright © 1999, ReefNews, Inc.